Before using the Email Snapshots, Send Videos to Web or Send Videos to Email features, you must set up the proper internet settings. 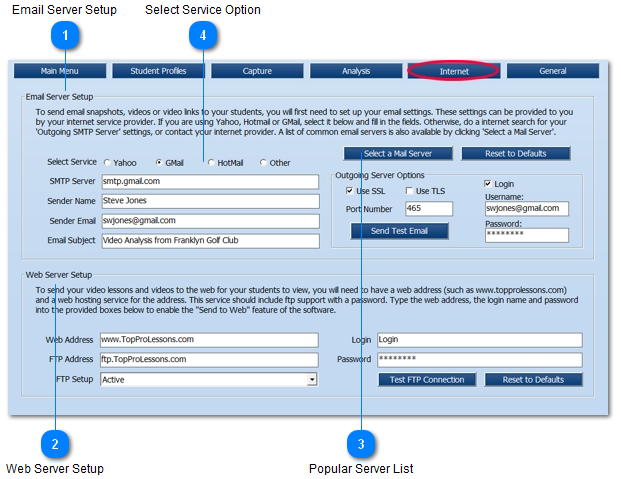 To send email snapshots, videos or video links to your students, you will first need to set up your email settings. If you use Yahoo, GMail or Hotmail, much of the information can be already filled in for you (see item 4). If you use Outlook, you can find these settings in the "Accounts" section of your Outlook or Outlook Express email program, or contact your internet provider. A list of common email servers is also available. Click the Select a Mail Server button (3) to display a list of common email servers. The "Email Subject" will be the Subject of the emails that will be sent. Tip #1: You can open a free Yahoo, Hotmail or Gmail account if you do not have a email account. Tip #2: If you are using a cable provider, you usually do not have to "Login" when sending emails from your home (usually "Use SSL" is unchecked, "Login" is unchecked, "Port Number" is 25). Tip #3: Click the Send Test Email button to test your settings (this will send a test email to the Sender Email <---which is you). Tip #4: Click the Reset to Defaults button to start over. To send your video lessons and videos to the web for your students to view, you will need to have a web address (such as www.topprolessons.com) and a web hosting service for the address. This service should include ftp support with a password. Type the web address, the login name and password into the provided boxes below to enable the Send to Web feature of the software. Tip #1: Currently (at the time of this writing) the sample site www.topprolessons.com is fully functional. Feel free to use it as much as you like. Tip #2: Click the Test FTP Connection to test your settings. Tip #3: Click the Reset to Defaults button to start over. Click the Popular Server List button (3) to display a list of common email servers. If you use Yahoo, GMail or Hotmail, much of the email information can be filled in automatically. Select your email service from the list, then add your Sender Email, Username and Password.